This trip leaves later in the morning. We arrive at Molokini after all of the big tour boats have left. We snorkel the inside and outer reef and/ or the backside (conditions permitting) of Molokini without Crowds and get you back in around two hours. We almost always make it to Molokini on this one, but if conditions are not favorable, a shoreline alternate may be selected. Trip includes beverages and snorkel gear. The Molokini Express is ideal for those who wish to enjoy the crystal clear waters and abundant marine life at Molokini but prefer to limit their time on the water to 2 hours. 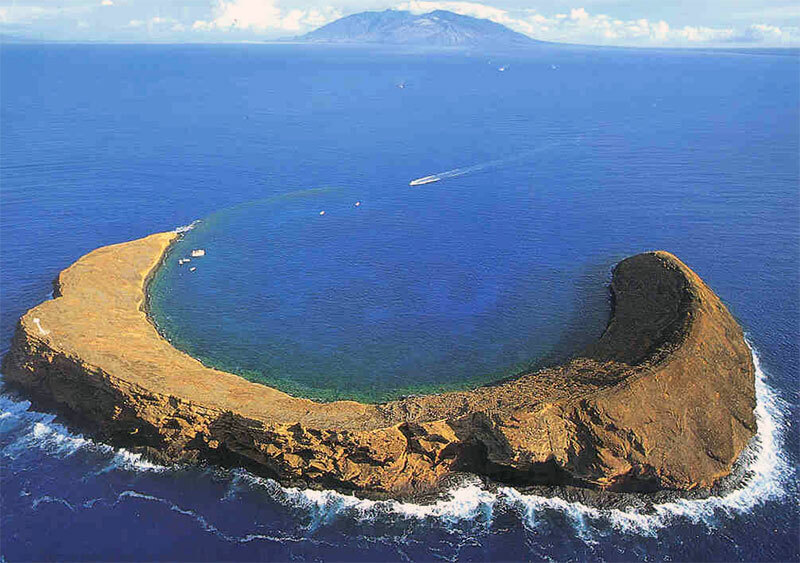 Molokini is a crescent-shaped, partially submerged volcanic crater which forms a small, uninhabited islet located in Alalakeiki Channel between the islands of Maui and Kahoʻolawe. By arriving at the crater just after most of the other boats have just departed, we find the area to be almost empty allowing us to drift snorkel large areas of the rim if we choose to. One of the most popular and spectacular drifts is over the outer reef formed by the rim of the volcano which at points is only two or three feet deep and then drops off on the outside to 200 feet. Gliding over the reef gives one the "feeling of flying" as you look off the edge of the world! The backside of Molokini might remind one of "The Abyss" as the wall plunges to depths of 300 to 400 feet. If the wind picks up on the inside of the crater, this area is often the calmest water for snorkeling. Tropical fish are just about everywhere, but the shafts of light, awesome visibility, towering cliffs and sheer drop offs are what make this site so unique. 100% refundable if cancelled prior to 24 hours. If a private, 100% refund if cancelled 5 days prior to charter. No Exceptions. No pregnant passengers or those with back or neck problems. No Children under 4 years of age; adult supervision required for those under 12. No wheel chair accommodations or service animals.